It can be a dilemma to know what to serve when you have family and friends over for dinner and you're trying to stick to your diet. We generally assume that we have to cook a lavish, calorie- laden meal - but is it possible to entertain without throwing all of our good intentions out of the window? We say it is! Here are some tips, and also some dinner party recipe ideas to help. We've also included a few breakfast suggestions too, if your guests are staying the night. You never know, they might thank you for the lighter dishes if they are watching their weight too! First and foremost - plan in advance! 1) Factor in some extra calories for the weekend by using the 'Easy days' setting in your Food Diary. This will redistribute your calorie allowance across the week giving you more calories for the weekend. To do this, go to your Food Diary and click on 'Settings' (just below the 'My Profile' tab). Scroll down to the 'Set an easier calorie target' section. Tick which days you are going to need a few more calories, followed by the 'Apply Changes' button. 2) Decide on your menu and use the Recipe Calculator in 'Meals/Recipes' to work out number of calories per serving in the dishes you're planning to cook. This way you know in advance if you need to go easy on your own servings. 3) Once you've worked out your menu, see if there are any ingredient swaps you can make to save calories to help you but that no one else will notice. For example, if you're using cheese, use a low fat one, if you're using cream - could crème fraiche work instead? Use low fat spread where you can, try fry light instead of oil, skimmed milk instead of semi-skimmed and so on. Making a few changes will help reduce the calorie content - use the Recipe Calculator to work out the saving. 4) Now you are ready to shop! Doing your food shop online is the best way to stick to your list and not get distracted into making impulse buys. 5) On the day of the meal, don't be tempted to starve yourself in preparation for the evening. If you feel ravenous beforehand, your brain will be more interested in higher calorie foods and you're like to give yourself more than you need. Just be calorie-wise during the day by having a healthy breakfast and light lunch. Try and have a small snack before your guests arrive so you're not starving when they turn up. An apple is normally a good option - at around 60 calories it's much less than demolishing the nibbles. 1) Go easy on the alcohol - you could save around 500 calories by sticking to water or low calorie drinks. If you do want alcohol, the best option would be something like a white wine spritzer made with soda water, or a clear spirit such as vodka with a diet mixer. 2) Limit the amount of nibbles you consume. If you normally put things like nuts and crisps out, why not include some carrot, pepper and cucumber sticks on a plate with a tomato based salsa as well? Breadsticks are a good option too at around 20 cals each. 3) Put a big bowl of steamed vegetables or fresh salad on the table, and fill half of your plate with these before serving the rest of the meal. 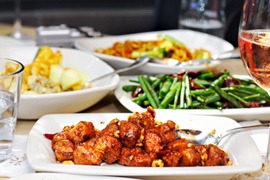 Green beans, asparagus, broccoli and baby corn all have 30 calories or less per 100g. 4) Eat slowly and enjoy your food. It will also fill you up more as it takes our brain 20 minutes to register the food we've eaten. So chat, pace yourself and give your meal chance to hit your stomach. 5) Listen to your body and stop when you're full. It might seem obvious, but the majority of us overeat because it's on our plate. Serve yourself slightly less than you would normally have - chances are you won't notice once you are socialising. Choose a reduced fat Cheddar such as Cathedral City Lighter and save over 30 calories and 4g fat per 30g slice. Also opt for water biscuits - around 25 calories each instead of 45 calories for a Cornish Wafer biscuit. Go easy on chutneys and pickles. Opt for tomato-based ones such as tomato and chilli chutney. Avoid ones which are 'jams' as these are often higher in sugar and calories. Add fresh fruit and veg sticks to your cheese board. Apple and grapes both go really well with cheese, as does celery and pickled onions. All of these are low in calories, and count towards your 5-a-day. If your guests are staying overnight, you also need to think about breakfast the next morning. Again, planning ahead helps. 1) Croissants - choose 'lighter' or 'reduced fat' versions. Most supermarkets have their own branded option, or you could try Sunblest or Weight Watchers - all are under 170 calories per croissant (saves 130 calories compared to a standard croissant). Skip the butter and just add a teaspoon of reduced sugar jam. 2) Cooked breakfast - try a toasted English Muffin topped with 2 poached eggs. This contains around 300 calories and is a filling start to the day. Warburton's Tear & Toast Muffins are the lowest calories at just 138 cals each. 3) Fresh fruit - serve up a fresh fruit salad with low fat natural yogurt. As well as being low in calories, it also counts towards your 5-a-day. Chop up banana, strawberries, melon, kiwi fruit, tinned pineapple (in own juice) and Satsumas and serve with a low fat natural yogurt for around 225 calories and 0.5g fat for a large bowl. 4) A full English breakfast - doesn't have to use up your entire days calories. Try our 'healthy' version for around 550 calories. Grill 1 x rasher fat trimmed bacon, 1 x low fat / vegetarian sausage, 1 x grilled tomato, half a tin of low sugar beans (such as Heinz reduced sugar & salt), 1 x poached egg and a slice of wholemeal toast. Also, by having a bigger breakfast you might find you want less for lunch. 5) Pancakes - don't have to be unhealthy. Toast 2 x Kingsmill pancakes with 100g warmed mixed berries and a dollop of low fat natural yogurt for a different breakfast option. It contains around 260 calories and looks really attractive on a plate too. Let guests help themselves to things such as bread, rice or potatoes. It allows them to make their own choice on the portion size they have, rather than you having to worry you're not giving enough / too much. Always keep a jug of water on the table with a glass for each person. If it's there you're more likely to drink it. Great if you're trying to keep off the alcohol for the night, or for pacing your drinks. Avoid putting salt on the table. Not only does it help with the health of your heart, it will also reduce dehydration (especially if you're drinking too). Use plenty of herbs and spices when cooking - not only does spicy food rev up your metabolism, it will stop you adding condiments to your plate which can really add to your calorie intake. 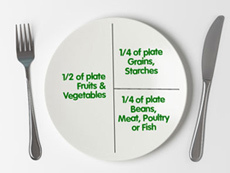 Follow the principle of the 'Eatwell Plate' - ½ your plate with fresh fruits / vegetables / salad, ¼ of your plate with starchy carbohydrates (wholewheat pasta, brown rice, potatoes) and ¼ of your plate with a protein source such as meat, beans, poultry, fish etc. Stuck for inspiration? Here are some recipes that make very respectable dinner dishes while still being fairly low in calories.